This is it – my last book review for 2011, and WOW – what a book! Trish Burr’s new text, Colour Confidence in Embroidery, is the first of its kind. 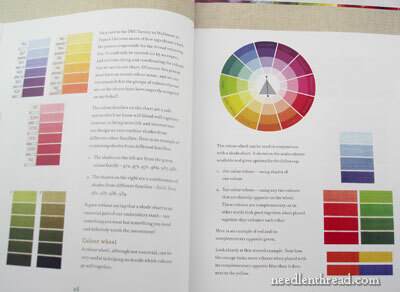 Sure, there are several color theory books out there that have to do with textiles, but these are generally geared towards fabric, with the exception of a couple color theory books that have to do with color choice in abstract needlepoint and cross stitch design. These latter books rely on technical color theory, adhering rather rigidly to the dictates of the color wheel, and advancing color theories through technical language and hypothetical design scenarios. Until now, we’ve yet to see a book on color, focusing on embroidery, that is accessible, instructive, practical, applicable, and beautiful. 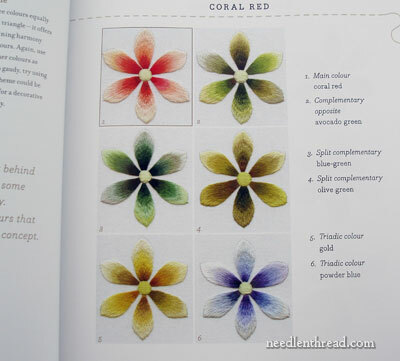 Trish has achieved all of the above with her new book, Colour Confidence in Embroidery. 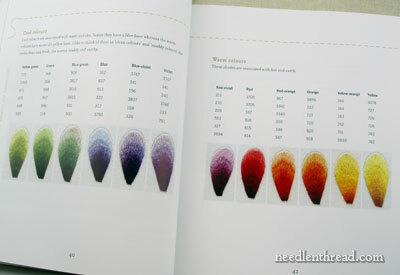 When pondering an embroidery project, if you’ve ever found yourself asking, “But what colors should I use?” then this is a book you need. (And haven’t we all asked that question at some point or another?) 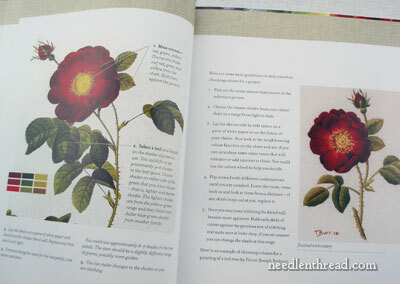 It’s THE color reference book for hand embroiderers – and it will not go neglected on your bookshelf. Trish, you see, is a master of color. When looking at her needleplainting, it is the color that amazes the viewer and makes the work really live. 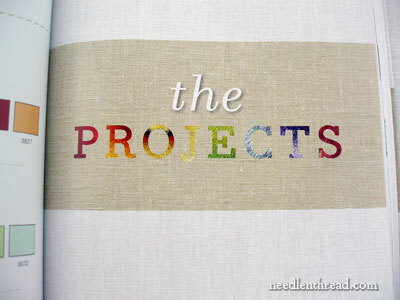 And in the book, Trish teaches us how to achieve the same results in our embroidery projects. 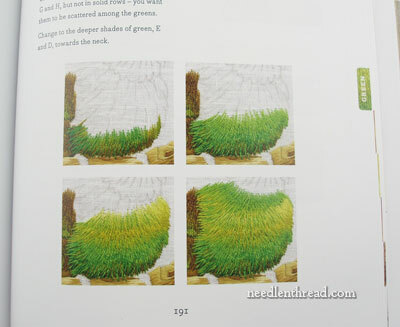 The book focuses on needlepainting, but, in practical application, the lessons within can apply to all types of surface embroidery. After an introduction & discussion of materials and techniques, the book launches into the whole question of color by discussing tools for selecting colors. Definitions of color terminology are clarified. 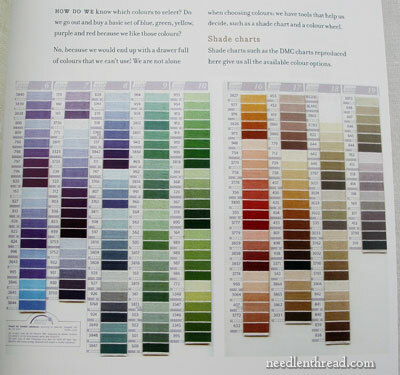 The color wheels is referred to throughout the book, but more often, thread charts are the focus. 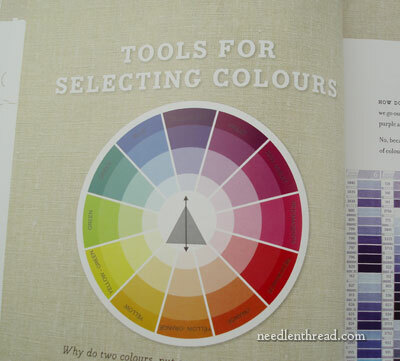 This is, after all, a book about color in embroidery, so thread charts hold center stage. 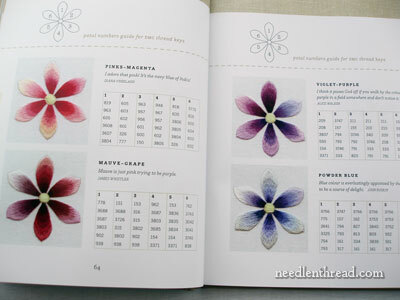 Trish uses DMC thread charts, because DMC is pretty much the universally available embroidery floss. It’s nice to have the thread charts printed out for reference. These are images of “real” thread charts – that is, the original thread charts for the images are made with real thread. These images of real thread impart a solid sense of the focus of the book: embroidery. Whenever the color wheel comes up, the thread charts are not far away! Trish explains how the color wheel works and shows how to apply the color wheel to selection of thread colors. She talks about what color families go well together and how color families and shades can be mixed to good effect. She talks about backgrounds, and how background colors affect color choice. 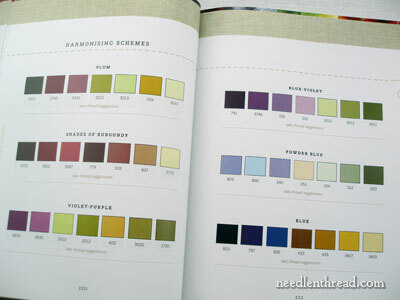 In talking about how to select colors for embroidery, Trish distinguishes between color for images that are already colored (for example, paintings that are reproduced in embroidery) and color for projects that require the selection of a color scheme (for example, for stitching an original design in crewel work). She demonstrates how to isolate colors in an image and build a range of shades around the isolated colors. In the section focusing on how color affects our embroidery, we see how well-chosen colors and shades make a huge difference in needlework. Shades are an important part of color. With embroidered examples, Trish demonstrates how color changes and shading using a range of shades are more effective than flat colors that don’t employ contrast. Later in the book, there’s a whole section devoted to the importance of contrast and how to achieve contrast in embroidery. Contrast is what really brings needlework to life, and this section demonstrates that point well. These various lessons are clearly illustrated with stitched examples in such a way that the reader can grasp the concepts with ease and can apply them with confidence. Cool colors and warm colors are discussed, as well as degrees of cool and warm colors, and combining cool and warm colors. This is one of the best parts of the book: Color Combinations! I don’t know if this is my favorite part of the book because Trish has already done all the work for us by putting together myriad fantastic color combinations and shades, all numbered out with corresponding DMC thread numbers… or if it’s my favorite section because the color is so dazzling. So many color combinations! And all presented in stitched examples with the corresponding thread numbers! This is an amazing and useful (super-useful) section. 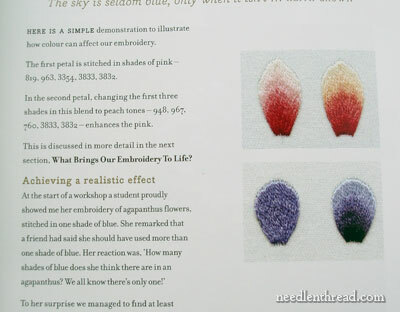 There’s also an excellent section on choosing complimentary colors, where we learn why certain colors work well together, and again, we see the colors and shades worked out in real embroidered examples. Trish also supplies pages and pages of different color & design schemes, represented by these rows of color chips. These are schemes that can be adapted to embroidery projects (or really, to any projects that involve the use of color – and what artistic endeavor doesn’t?) She demonstrates how a color scheme can be adapted to thread choice. There are lots of fun and beautiful color combinations in this section, perfect for getting the juices flowing when you’re ready to think color. And, finally, we have The Projects! Here, a fantastic selection of Trish’s beautiful embroidery projects are presented, broken down by color. There are thirteen projects in the book, twelve of which are representative of a particular color: red, pink, mauve, purple, blue, turquoise, green, gold, yellow, orange, and brown. The last project is the Sacred Kingfisher, a gorgeous bird in blues and golds. 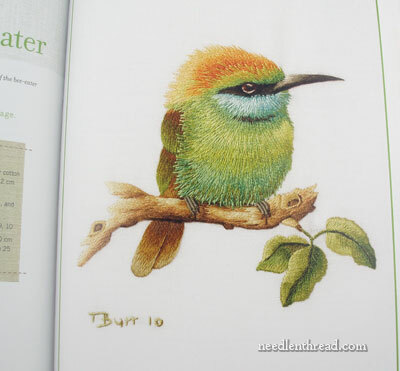 The Little Green Bee-Eater is the project representative of the color green. He is my favorite little guy! I love him. He is so smug. 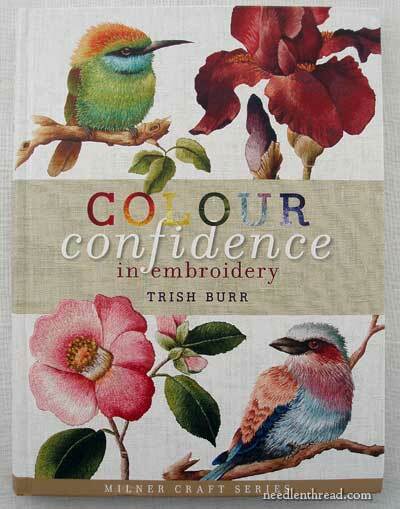 So that’s Trish Burr’s new book, Colour Confidence in Embroidery! It’s a definite essential for the embroiderer’s library. Pros: Too many to list! The book is easy to understand; the concepts are presented in a way that makes them easy to implement. The book is chockfull of useful information and instruction. The projects are gorgeous. Cons: The book is a bit pricey, but the book is huge in more ways than one. The subject – color – is a huge one, and it is well dealt with. And the book (hardcover) is huge, too, ticking in at 256 pages. In the US, you can find Colour Confidence in Embroidery through Amazon. Worldwide, with free shipping, you can find Colour Confidence in Embroidery through Book Depository. Too late for my Christmas wish list, but I’m definitely there in February. I think I might be willing to buy it just for the illustrations. What an amazing book. I am an interior designer and refer to color theory alot in my work (commercial design). I could see this being such a helpful tool for hand embroidery. Can’t wait to get one. And I too love that “smug” little bird! That’s a word I often use to describe my beloved Sheltie/Aussie mix at home! Wow. This is a great book! I have two of her books already and this is going immediately into my wishlist. Great book reviews by the way, i LOVE every single one of them! Because of you I discovered Trish Burr…thanks! When I wrote to Santa, I put this book at the top of my list. I underlined it, circled it and starred it. I hope Santa gets the message. Another book on my wish list! I’m not sure if I should say “thank you” or not 🙂 . That’s one thing about needlepainting that you don’t deal with in most other textile arts, adding those few stitches of a different color in the right spots make it come alive. Sometimes it’s a blend of a smaller color range like the bee-eater, sometimes it’s totally unexpected colors like that Chinese needlework picture you showed a while back. Thanks for the great review! These past 2 days I’ve been contemplating purchasing this book, the only thing holding me back was there were no reviews. I had the feeling that here I was going to find a good review on it soon :-). Just ordered mine! Thanks Again. Thank you for reviewing this – I did not know of this book! This is something that I plan to purchase and read heavily! Everything T.Burr has published is a treasure – this book included. This is a magnificent book. I’m a visual learner and this offers everything I need to improve my stitching. Sure I can put needle to fabric but choosing the right colors has always been a major problem for me. I can look at nature for combinations but making it work with floss just never quite works. That’s why I depend on patterns that tell me which colors to use. I’d love to “graduate” to making something of my own. This just might be what I need. I’ll wait till Feb., save up my nickels and dimes 🙂 to buy it. You know what I’m muttering, don’t you. “My name is Mary Anne and I’m a bookaholic”…as I wander away in search of my already overly long wish list…. Wow, you give great book reviews! This is one of those that I had thought that it looked like a nice book but one that I could live without. Now…after reading your review, it’s moved to the I have to have it list. I am drooling over this book. I cannot wait for it to be available. Also has me wanting the Needle Painting Fresh Ideas for Beginners she wrote too!! Both are now part of my wishlist. Awesome! What a beautiful book! I was wondering do you know Helen M. Stevens work? I have her book, ‘The Timeless Art of Embroidery’. What do you think of her work? It has alot of long stitches and blending that looks like needle painting. It’s a book on my wish-list! I have “Long and short stitches embroidery” and I love it! If “Long and short stitches” is The College of Embroidery ;-),”Colour confidential” is kind of doctorate. I’m using mostly DMC, besides, it’s available in many countries of the world. Maybe someone will translate it to Polish. I’m reading in English, but Polish edition would be cheaper. You perfectly now embroidery patterns from 17 century. Do You know it was beginning for some Polish folk embroidery. Thank you Mary for your comprehensive review of Trish Burr’s books. I have a couple of them and was very lucky to get quite a bit cheaper. Look around a lot at big book sellers who have multiple merchants on their seller lists. I found Trish Burr’s books most helpful and easy to follow. Doing her samples is a must as you will see how she gets the colour to flow. And if you do the little test runs they are even pretty to frame as they are samplers. So put your name on them. I wish you Mary and yours a lovely festive season as I do to the rest of your followers. Your work will mirror your happiness. I am hoping we here in my part of Australia have cooler weather, it will make the cooking a lot easier. Cheerio to all, stay safe and healthy and most of all happy. I look forward to chatting again in the New Year. The color combinations look devine … can’t wait til February. G’day there Mary, Oh how I love to see inside. Thanks. And, a beautiful, safe and happy Christmas and holidays to you and yours. Thank you for all your efforts, a year well spent. When Trish announced the book was ready I purchased my copy from the Book Depository and got free shipping. This past weekend I read the entire book. Totally AWESOME!!!! I hope to start this year out working each and every color scheme she has in the book. I believe it will be awesome to have for future embroidery work to be able to look at what schemes go together. I have been studying color for a while now and dye my own fabrics and this book is just awesome with the DMC colors she used. I mostly use DMC so I was thrilled to find the whole book is mostly DMC. I know it will take time to make all these samples up but by the time I done all those I think I could truly say I am prepared to do all the lessons at the end of the book. Such beautiful work. Everyone should have a copy of this book. merci Mary de nous faire découvrir ce livre. je le mets sur ma liste de souhaits!! je vous souhaite de très joyeuses fêtes de Noêl. Came into your site to ask about colors,and the first thing I saw was the book about colors. Great timing. My question was to ask if I should use as many colors as the PC stitch program suggest. I also have the DMC color samples and love it. The PC Stitch is for counted cross stitch, which I don’t do. But it allows me to check colors. Only there are in some flowers over one hundred colors. I don’t think it is necessary to use that many. So this book could be of help to me. I’ll just have to get it. Thanks for posting it. My copy of this book arrived a week ago. (UK). It is the most informative, fabulous book I have ever owned. I’m so thrilled with it. I do thread painting quite often, but this has already pointed out to me things I should have done, and how I should have done them. I have most of Helen M Stevens books on embroidery and they are gorgeous, but I truly think this book by Trish Burr is a real winner. Hmm… I think you’ve seen the pictures of the largest embroidery project I’ve ever completed. I took some Jacobean designs and embroidered them using DMC floss on linen. I am currently working on some crewel work, but this book could definitely help with some of the projects I have in mind. thank you for let me know this wonderful book!!! As I don’t speak english yet I can’t express how much I’m thrilled with it. Thank you for yor rewiew Mary. This sounds like an awesome book! Trish Burr’s work is dazzling!